The U.S. government on Thursday charged 14 people, at least seven of them Americans, with supporting "a deadly pipeline" routing money and fighters to the militant group al-Shabab in Somalia. The cases in the states of Minnesota, California and Alabama reflect "a very disturbing trend" of increasing support for terrorism, Attorney General Eric Holder told a news conference Thursday. The attorney general credited Muslim community leaders in the United States for regularly denouncing terrorists and for providing critical assistance to law enforcement to help disrupt terrorist plots and combat radicalization. "We must ... work to prevent this type of radicalization from ever taking hold," Holder said. Most of those charged are U.S. citizens. Some supported the terrorist organization from the United States and others traveled to Somalia to join up with al-Shabab. Al-Shabab is a Somali insurgent faction embracing a radical form of Islam similar to the harsh, conservative brand practiced by Afghanistan's Taliban regime. Its fighters, numbering several thousand strong, are battling Somalia's weakened government and have been branded a terrorist group by the U.S. and other Western countries. The federal government designated al-Shabab a foreign terrorist organization in March 2008, and said it has ties to al Qaeda. The suspects are charged under the very broad statues regarding "material support" to terrorists. They include U.S. citizens and residents in California, Alabama and Minnesota, home to the largest Somali community in the United States. Holder said that the suspect were part of "a deadly pipeline that has routed funding and fighters to al-Shabab from across the United States." Holder praised the U.S. Muslim community's condemnation of extremist ideology and violence and thanked the Somali community in Minnesota, in particular, for its support during the terrorism investigation. Still, he said, Thursday's charges are indicative of a trend - "an increasing number of individuals, including U.S. citizens, who have become captivated by extremist ideologies." The largest of the indictments unsealed Thursday charges 10 men for leaving the United States to join al-Shabaab. Seven of those defendants had been previously charged by either indictment or criminal complaint. The remaining three defendants had not been charged before. The Obama administration also released a report Thursday warning that says al Qaeda's core membership in Pakistan along with affiliates in Africa and Yemen pose the most dangerous terrorist threat to the United States and its interests abroad. The State Department's annual report on worldwide terrorism noted with concern that al Qaeda, particularly in Pakistan, Yemen and Somalia, appeared to be attracting growing numbers of radicalized Americans to its cause. Roughly 20 men from the U.S. - all but one of Somali descent - left Minnesota from December 2007 through October 2009 to join al-Shabab, which seeks to establish an Islamic state in Somalia. Somali-Americans have been recruited and have taken part in suicide bombings in Somalia, and U.S. officials fear trained Somali-American terror plotters could return to the United States. CBS News national security analyst Juan Zarate says, "That has always been the worst case scenario, that American Somalis could be enlisted, trained and then deployed to hit sites in the United States." However, CBS News' Bob Orr reports that U.S. officials say so far there is no evidence that al Shabaab is planning an attack against America and the young men who have left for the fight have not yet tried to come home. Al-Shabab last month claimed twin bombings in Uganda that killed 76 during the World Cup final, the group's first international attack. Uganda and Burundi both have peacekeeping forces in Mogadishu, the Somali capital, and al-Shabab has vowed to continue attacks against the two countries. Al-Shabab members began pledging allegiance to al Qaeda last year. One of its most famous members is known as Abu Mansour al-Amriki, or "the American." He appeared in a jihadist video in May 2009. Omar Jamal, the first secretary at the Permanent Mission of the Somali Republic to the United Nations, said Thursday he was happy to hear of the indictments. "We welcome this as a positive step toward the beginning of the defeat of al-Shabab," said Jamal, a longtime advocate for the Somali community in Minneapolis. The charges in Minnesota are the latest development in an inquiry in that state which has been under way for some time. Two indictments unsealed in Minnesota on Thursday added five new names to a list of people charged in the investigation in that state, bringing the total charged in the state to 19. Two were women from the Rochester, Minn., area accused of raising money for al-Shabab. The Rochester indictment alleges that two Somali women and others went door-to-door in the U.S. and Canada to raise funds for al-Shabab's operations in Somalia. The indictment says the women raised the money under false pretenses, claiming it would go to the poor and needy, and used phony names for recipients to conceal that the money was going to al-Shabab. The indictment alleges that the women, Amina Farah Ali and Hawo Mohamed Hassan, also raised money by making direct appeals to people in teleconferences "in which they and other speakers encouraged financial contributions to support violent jihad in Somalia." During one teleconference, the indictment says, Ali told others "to forget about the other charities" and focus on "the Jihad." The indictment says Ali and others sent the funds to al-Shabab through various hawalas, money transfer businesses that are a common source of financial transactions in the Islamic world. Ali is accused of sending $8,608 to al-Shabab on 12 different occasions between Sept. 17 2008 through July 5, 2009. After the FBI searched Ali's home in 2009, she allegedly contacted an al-Shabab leader in southern Somalia and said: "I was questioned by the enemy here. ... they took all my stuff and are investigating it ... do not accept calls from anyone." The Minneapolis indictment said two men, Amina Farah Ali and Hawo Mohamed Hassan, raised money for al-Shabab both by open appeals on teleconferences and by pretending in other cases that the money was for the poor and needy. The indictment cited 12 money transfers to al-Shabaab in 2008 and 2009 totaling $8,608. The charges included providing material support to a terrorist group and lying to authorities. "While our investigations are ongoing around the country, these arrests and charges should serve as an unmistakable warning to others considering joining terrorist groups like al-Shabaab - if you choose this route you can expect to find yourself in a U.S. jail cell or a casualty on the battlefield in Somalia," Holder said. 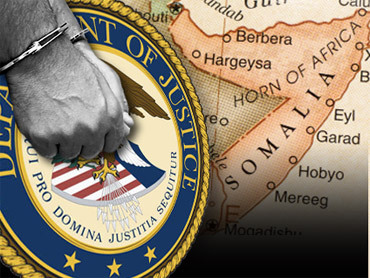 In November, federal prosecutors announced charges against eight people as part of the long-running investigation of young men who left the United States to fight in Somalia. During a visit to the United States in October, the president of Somalia denounced the recruiting and said he plans to work with the U.S. government to bring those still alive back home. "We believe this is a wrong action, that these young men were wronged, they were robbed out of their life. Their parents were wronged," Ahmed told the AP through an interpreter. "The laws of the United States were violated. The security of Somalia was violated. So we condemn (them) without reservation." Ahmed was in the Minneapolis area - home of the largest Somali population in the U.S. - to build support as his government tries to bring peace to the Horn of Africa country that has been plagued by violence for decades. The nation of 7 million people has not had a functioning government since 1991, when clan-based warlords overthrew a dictator and then turned on each other. In another case unrelated to Thursday's developments, a 26-year-old Chicago man who told an FBI informant that he didn't expect to reach the age of 30 was charged with plotting to go to Somalia to become a suicide bomber for al Qaeda and al-Shabab. During a brief hearing Wednesday, prosecutors told a judge that the Chicago man, Shaker Masri, attempted to provide support through the use of a weapon of mass destruction outside the United States.